Feb 25,2013, it could have been yet another day in IIT Bombay, hadn’t we got the chance to witness the speech of a legendary person, Padma Vibhushan, one of the most repected leaders in India and in world in fact, Mr Ratan Naval Tata. The convocation hall which was jam packed with more than 1500 students, who were stuck with awe waiting to witness the speech of a legend. Then all a sudden, thousands of hands were put together to welcome the man of steel, a true inspiration. Few months after he retired, Ratan Tata remains a personal enigma despite the millions of words written about him. 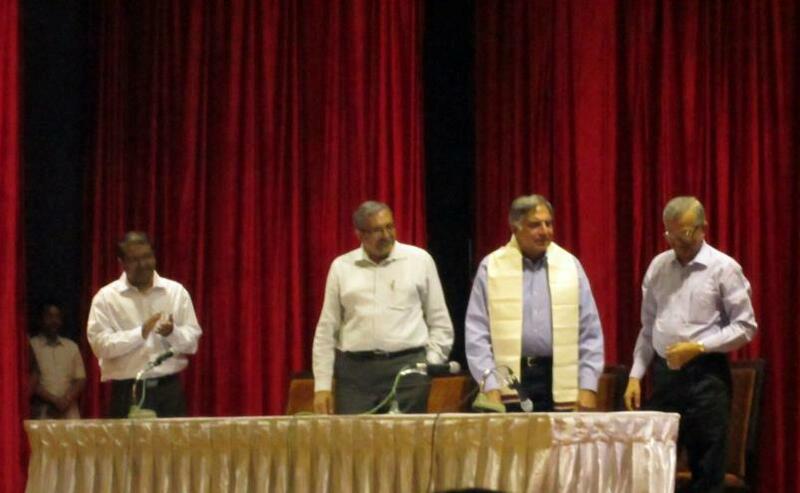 It was a student interaction session and all of us were ready, more than ever, to speak to Mr Tata. In fact for a question as what was the secret of TATA’s success – he gave answer in two words – Quality and not compromising in Values. The industrialist, known for his strict adherence to ethics despite India's sometimes murky corporate and government culture, said that he always aligned his philosophy with that of TATA to invest and grow. To think out of box and at the same time to be humble and sensitive to the society was the suggestion from a person, who is single and leads a modest lifestyle in his bachelor apartment. He reiterated that ideological motivation is much required for the investors to take the willing risk in the present Indian context, where empowerment of private sector is much limited. When a student asked what was required for origin of more TATAs in the society, he said that it would be possible if education and career should be based on talent rather basing on their background abilities to pay for them! Later speaking about the endowment to Harvard Business School, Mr Tata explained his strategic move to put India in the map of permanent managerial education. He said that it is time for India to move to manufacturing economy from service based economy, otherwise, India would become another UK, which did well in service economy until it collapsed. He also said that he is confident that India's days of robust growth will return. His only advice for the a thousand brilliant minds sitting in that room was, to be sensible to those millions who are deprived of many basic opportunities and to have more humility rather arrogance and he emphasized that education should be taught in social context for a better India. This was one of the most inspirational speeches, we ever witnessed in IIT Bombay. good Now that the WhatsApp app and also data source are duplicated, WhatsApp iPad utilize your PC to download Whatsapp IPA download Cydia nice.